John Ford wanted real faces in his films. While he would settle for Hollywood professionals when necessary, his preference was for authenticity over professionalism. Ford liked the rugged look of the residents of Moab, the small Utah town that served as the hub for filming Wagon Master (1950). He welcomed the locals as extras. But Ford imported his Indians from Monument Valley, approximately 150 miles south of Moab. When filming his classic film Stagecoach (1939) ten years earlier, Ford was introduced both to Monument Valley and the Diné—the Navajo people who lived in the area. He instinctively liked and trusted them. Over time, many came to return the respect, calling Ford “Natani Nez” which means “tall leader.” A core of about fifty Navajo emerged who would serve from that point on as Ford’s all-purpose Indians (regardless of the tribe they were supposed to be from). John Stanley often served as the unofficial leader of Ford’s Indian crew, organizing his team and translating for the Hollywood folk. Other key players among the Navajo were Bob Many Mules, Harry Black Horse, Pete Gray Eyes, George Holliday, Billy Yellow, Talks a Lot, Keith Smith, Lee and Frank Bradley, Stanley’s father Jack, and his brother Yellow Hair. Ford treated them fairly well, but they rarely received credit and their names remain largely absent from the standard film histories. During the winter of 1948, less than a year before the filming of Wagon Master, an unusually deep snow endangered the Native inhabitants of Monument Valley. According to Scott Eyman in the Ford biography Print the Legend, Ford swiftly and generously responded with Operation Haylift, arranging for friends in the military to airdrop food to the Navajo. 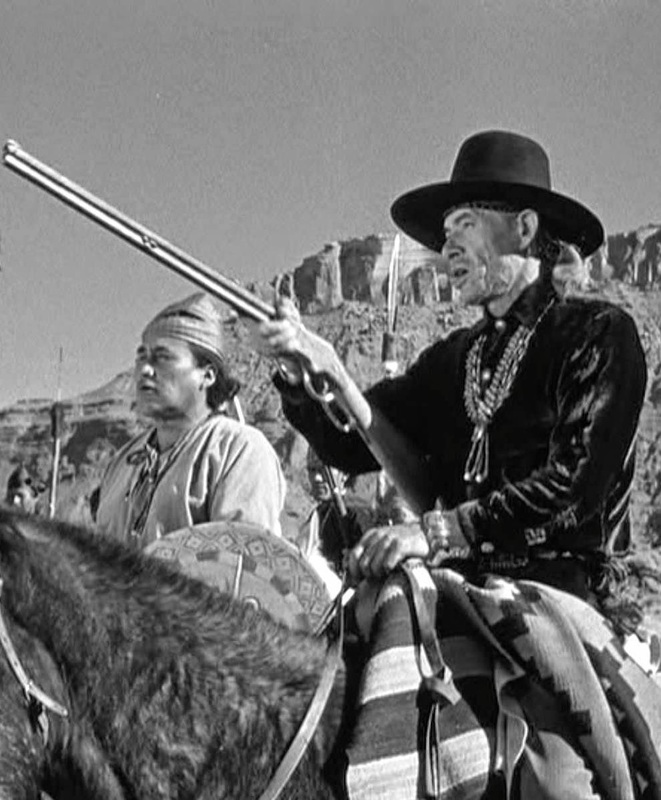 The following fall, he invited the Navajo wing of the Ford stock company to Moab for filming of his latest western. 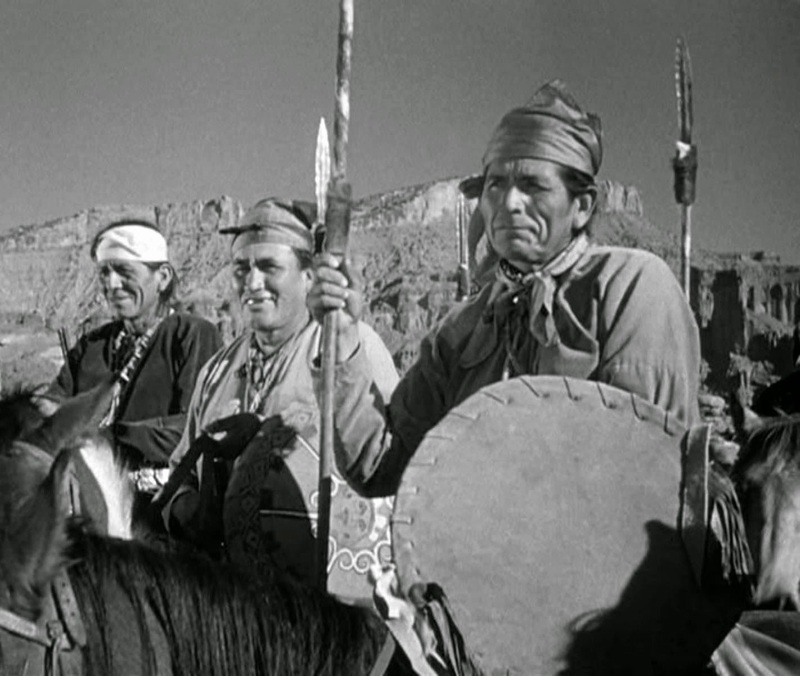 Navajo band in Wagon Master (1950). For the only time on a John Ford picture, the Navajo in Wagon Master were allowed to speak their own Navajo language on film. 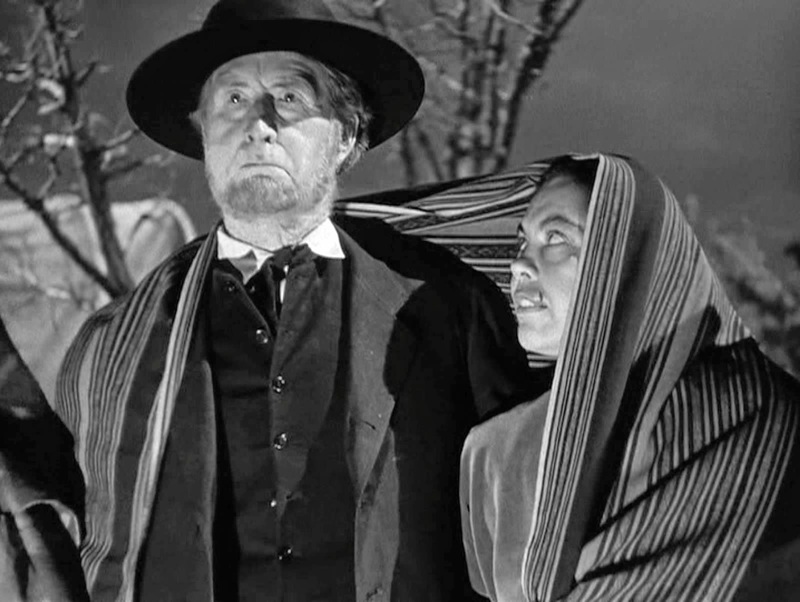 During the first tense encounter between the Navajo and the Mormon settlers, Travis Blue (Ben Johnson) volunteers Sandy Owens (Harry Carey Jr.) to translate. “He knows the language better than anyone,” Travis says. There was some truth to this as Carey had learned more than a smattering of the language from his Navajo nurse while growing up on a ranch near Hollywood. Linguistically, the exchange in Wagon Master is probably more authentic than you’d find in any other Hollywood western of the period. The important speaking role of the Navajo chief is played by Lee Bradley with impressive authority. Even though tensions between the cultures run high during the scene in the Navajo camp, the Indian viewpoint is respected. Best of all, the situation is resolved peacefully. I love that this is a John Ford western which prominently includes Indians—and in which no Indians die. 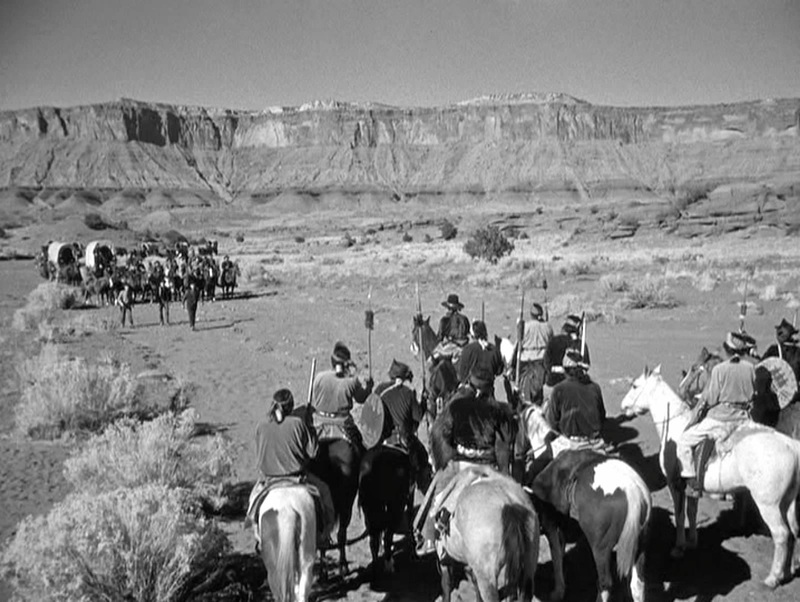 Harry Carey, Jr., Ben Johnson, and Ward Bond approach the Indians. 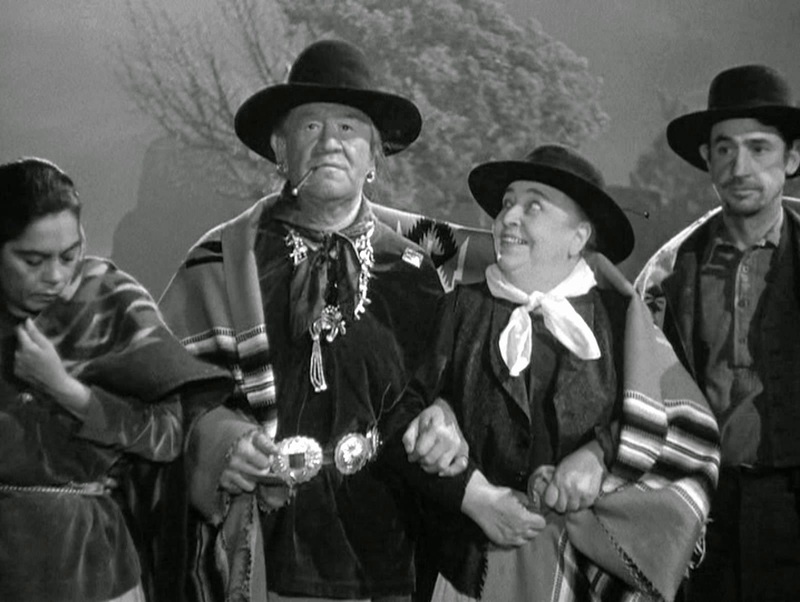 While most of the Indian actors in Wagon Master are Navajo, two are not. Maria “Movita” Castenada, who plays the part of the woman attacked by an outlaw, was not Native American. And the very memorable Jim Thorpe was a Native American, but not a Navajo. 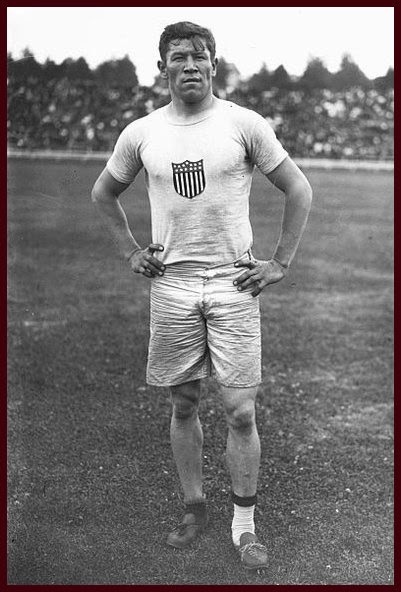 Jim Thorpe at the 1912 Olympics. Jim Thorpe came from Oklahoma, raised as a member of the Sac and Fox tribe. He became an international sensation when he dominated the 1912 Olympics, winning gold medals in the pentathlon and decathlon. Then he became even more famous when he was stripped of his Olympic medals after the press revealed that he had played two seasons of semi-professional baseball. Subsequently, Thorpe excelled in professional baseball, football, and basketball, gaining a reputation as the greatest all-around athlete of his day. When the Great Depression hit, Thorpe was in his early 40s, his athletic career behind him. Like so many others, he went to Hollywood, looking for work. From 1931 on, he appeared in bit parts in more than fifty movies. Wagon Master was the last of them, filmed when he was 61 years old. The following year, he was hospitalized for lip cancer. His health failing, he died of heart failure in 1953. In Wagon Master, Jim Thorpe is the Indian who dances next to Jane Darwell, a core member of the John Ford stock company. They share a fascinating shot together. Thorpe inscrutably stares straight ahead, his large body moving to the rhythm. Beside him, in strong contrast, Darwell is small and almost girlishly enthusiastic, looking up at her companion with an innocent amazement. I bet Ford loved that shot. Jim Thorpe and Jane Darwell at the dance at the Navajo camp. Mormon pioneer and Navajo at the dance. Many years later, when a statue of John Ford was dedicated in his hometown of Portland, Maine in 1998, a contingent of representatives from the Navajo Nation traveled across the country to participate in the ceremony. At the age of 96, medicine man Billy Yellow, who had served as a member in good standing of Ford’s stock company, led a prayer in honor of the director who had brought the Navajo’s beautiful homeland to the attention of a vast worldwide audience. 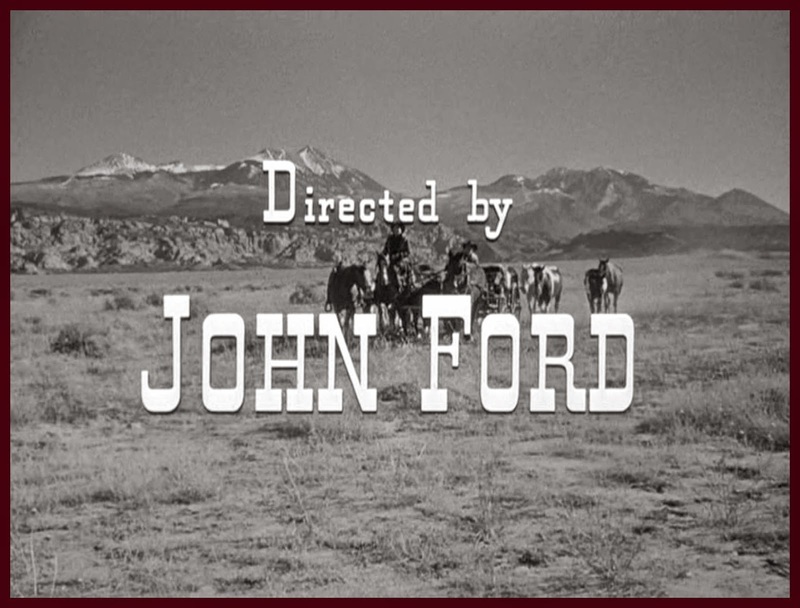 John Ford's credit on Wagon Master (1950). The Native stock company is always a welcome sight for this fan. "Oh, it's that guy." There's something about Ford's stock company that always makes me smile, whether it's Francis Ford grinning, or Danny Borzage on the accordion, or the Indians on the hillside. I wish I could have found more research on the exact nature of Navajo participation (and some photographs that identified our Indian stars!). It looks to me like Ford brought a couple of Navajo participants back to the studio for a scene like the dance, but most of the extras were the usual Hollywood suspects in makeup. Our real Navajo band is best scene in the exteriors. But I'd love to see some solid research into this. I like that you pointed out Ford's use of stock/character actors with real faces. I love how the camera closes in on these characters and how beautifully they're always filmed. Great post! I was glad to learn all the information you've included here. Thanks, Silver Screenings! 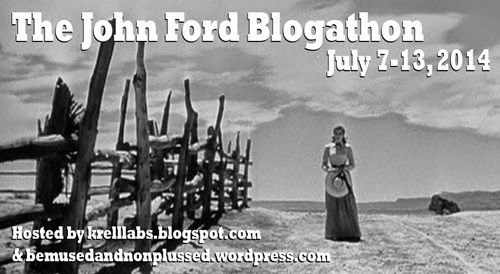 I see that we split Ford's self-proclaimed favorite movies between our blogs. Maybe I made the better choice this time! It felt like a great privilege to mention these names so their contributions can be remembered.